You’ll find Hula Restaurant on the Boardwalk at the end of the Colony Walk. The Colony Walk is a sort of mini-Boardwalk between 9th and 10th. As for why you should go… because Chef Dave Rihl’s cuisine is based on the Hawaiian plate-lunch concept – basically a protein, salad and rice. Dave perfected this technique during a stint with a lunch wagon on Oahu’s North Shore in the 1990s and it is one of the best meals on the island. One bite of the homemade tropical vinaigrette or sweet huli sauce and you’ll be glad Dave found his way back to the Jersey Shore. Dave and his crew prepare dishes using only the best ingredients (you’ll taste this immediately) and served with perfectly cooked rice and a salad – not your everyday Boardwalk fare. 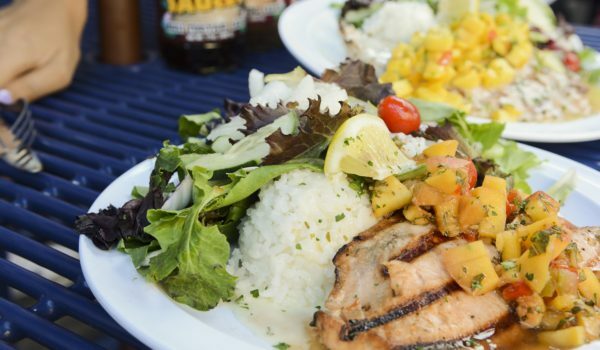 Dave’s recipe of fresh seafood and produce, mixed with a dash of Hawaiian flair, makes this restaurant something special. The staff is charming bunch who bring your plates out hot and fast.